NETWORK FINALS: Both ONCE UPON A TIME and QUANTICO gained 0.1 in final numbers, as did THE SIMPSONS, but both THE CARMICHAEL SHOW and CROWDED fell the same. CABLE HIGHLIGHTS: AMC’s FEAR THE WALKING DEAD was by far the highest-rated show of the night, on cable or broadcast. But its 3.08 was a big 1.85 below last year’s series premiere, and down 0.29 from the season finale. If the numbers go down, which usually happens post-premiere, FEAR may just be a very big hit rather than a phenomenon. TALKING DEAD plunged 2.02 from last week’s post-mothership show to 1.05. The MTV MOVIE AWARDS aired across the Viacom network platform, so its overall number was much higher than last year’s, but on MTV itself it was up only 0.03 to 0.78. (It was preceded by a TEEN MOM special at 0.71, and a PRE-SHOW at 0.45.) The rest of the rundown: 0.32 on Comedy Central, 0.16 on VH1, 0.14 on BET, 0.10 on TV Land, 0.09 on MTV2, 0.07/184K on CMT, 0.02/53K on VH1C, and 0.01/45K on Logo. On pay-TV, Starz’s THE GIRLFRIEND EXPERIENCE premiered low, with 0.11s for both of its half-hour episodes. Showtime’s BILLIONS was down a mere hundredth to 0.32 for its season finale, despite airing for the first time without a SHAMELESS lead-in, but HOUSE OF LIES returned at 0.17, down 0.03 from last season’s finale, and DICE premiered at an anemic 0.11, with THE CIRCUS down 0.01 to 0.05/149K. On HBO, VINYL was up 0.04 to 0.24, GIRLS ticked down to 0.27, the finale of TOGETHERNESS ticked up to 0.12, and LAST WEEK TONIGHT was off by 0.01 to 0.36. Golden State’s quest to reach 73 wins continued to thrive, with the NBA Network scoring 1.04 for the team’s showdown game with San Antonio. Adult Swim’s ROBOT CHICKEN jumped 0.29 to 0.84. Discovery’s NAKED & AFRAID rose 0.09 to 0.83. On Bravo, REAL HOUSEWIVES OF ATLANTA must have aired a reunion or some other non-regulation episode, since it plunged 0.53 to 0.68. 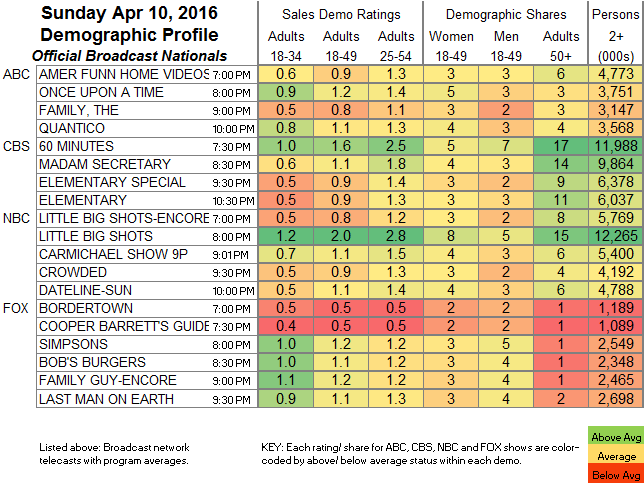 It was followed by 0.66 for SHAHS OF SUNSET and 0.64 (down 0.08) for REAL HOUSEWIVES OF THE POTOMAC. On Spike, BAR RESCUE gained 0.13 to 0.55, and LIFE OR DEBT was up 0.06 to 0.23. A&E’s INTERVENTION was at 0.41. On Food Network, SPRING BAKING CHAMPIONSIHP premiered at 0.39, GUY’S GROCERY GAMES climbed 0.05 to 0.37, and CUTTHROAT KITCHEN was up 0.05 to 0.34. National Geographic’s STORY OF GOD dropped 0.08 to 0.35. Hallmark’s WHEN CALLS THE HEART gained 0.08 to 0.33. 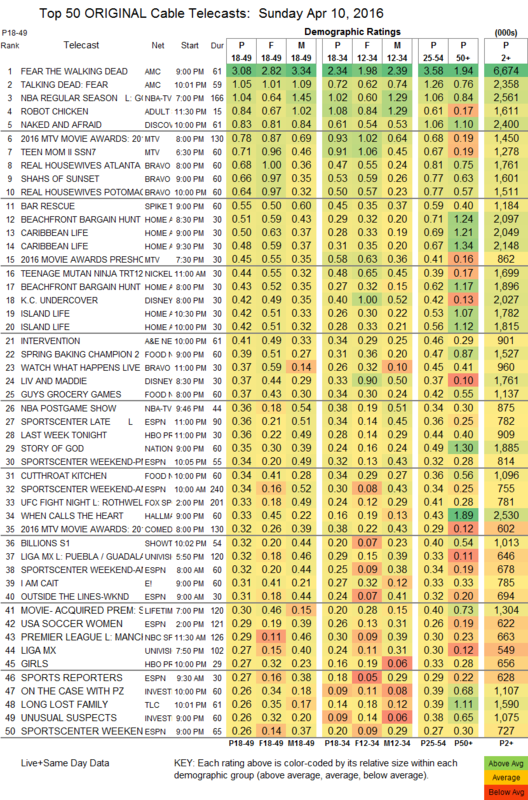 On E!, I AM CAIT had a 0.11 bump to 0.31. On TLC, LONG LOST FAMILY lost a tick to 0.26, and WHO DO YOU THINK YOU ARE was up 0.02 to 0.21.